Duckweed has the ability to multiply rapidly and can infest a pond or quiet bay in a matter of days. Duckweed can be a major nuisance for homeowners due to its ability to turn an otherwise beautiful pond into an unsightly mess. Luckily, controlling duckweed in ponds is very simple. We recommend our Dibrox® Herbicide - it is easy to use and will eliminate duckweed from your pond. 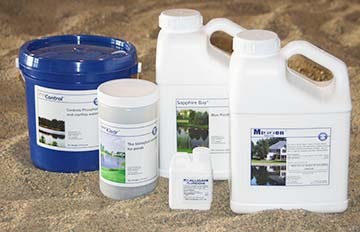 See our POND solutions to determine what products are suited for your pond. Duckweed is commonly spread by migratory birds flying between ponds with the tiny plants clinging to their feathers. 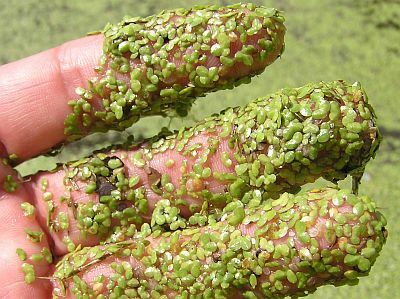 Duckweed is very prolific, and given enough nitrogen and phosphorus nutrients, it is possible for a new duckweed plant to be produced every 24 hours. This means that in just two weeks, a single parent plant can result in up to 17,500 plants! Extensive mats of duckweed colonies may cover an entire pond surface, depleting oxygen and blocking sunlight. Fish and submerged plants can be killed. 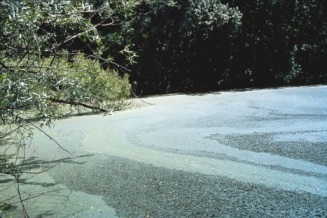 Because of this, duckweed infestation often contributes to poor pond health. Duckweed can tolerate a wide range pH, between 4.5 and 7.5, as well as temperatures between 68F (20C) and 86F (30C), making duckweed a challenging aquatic plant management issue worldwide. For effective duckweed control and removal at a reasonable cost (and without environmental damage or risk to water users), choose which POND Solution products you need to give you control over your duckweed. Diquat herbicide is also an effective short-term duckweed killer if used repeatedly. We recommend using our Dibrox® Herbicide which contains the same active ingredient as Diquat. If you have any questions about how to get rid of duckweed or would like to speak to us about duckweed control, please feel free to call us toll free at: 1-877-428-8898. Duckweed is one of the smallest flowering, free-floating plants found around the world. 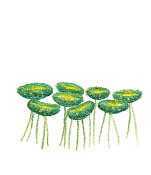 Measuring just 1/16" to 1/4" in length, duckweed floats on the water surface in colonies not attached to the bottom. Duckweed floats wherever the wind or currents take it, absorbing nutrients from the leaf undersurface and a very fine root hanging from it. Duckweed can have one leaf or up to three leaves, known as fronds, about the size of a pencil eraser head, with a single root hair. Duckweed prefers eutrophic, motionless fresh water in wetlands, ponds, lakes and slow moving streams. Duckweed requires a lot of nutrients to grow - especially nitrogen and phosphorus. Major sources of nutrients include Canada geese, lawn fertilizer, agricultural run off, leaking septic systems, and tree leaves. Our POND Solution products contain the best products to control duckweed and algae, including effective herbicide and nutrient reducing treatments.